This Farm Family's Life: How Do You Eat the Animals You Raise? How Do You Eat the Animals You Raise? How do you eat the animals you raise? This is a question I hear often, especially this time of year. We just finished our county fair last week. 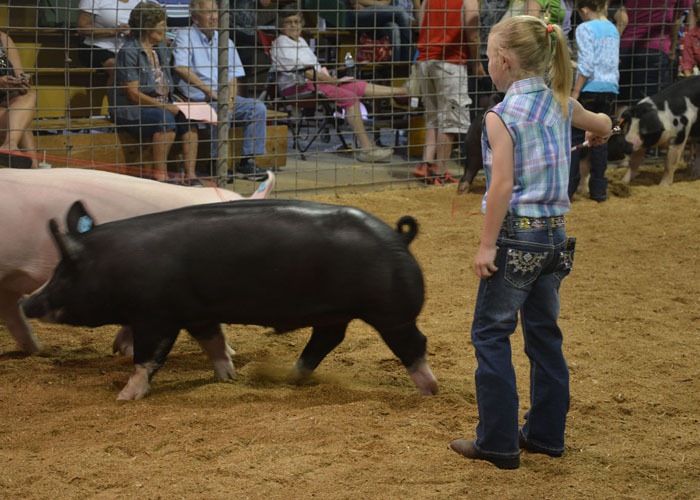 Our girls show pigs, dairy cows, and also do drawing, sewing, and woodworking. 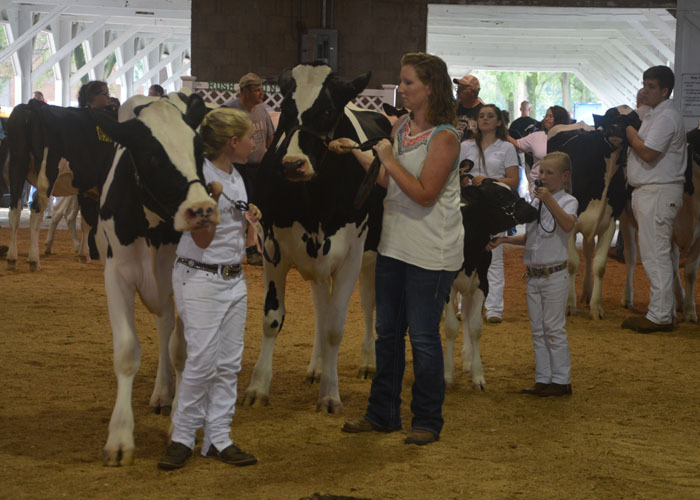 While I love all aspects of the fair, the livestock portion is probably my favorite because it allows the general public to get an up close look at livestock from a farm. 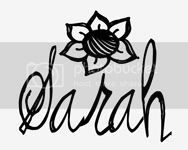 A couple people asked me this question just last week, so I thought it would be the perfect time to write a post on the topic! 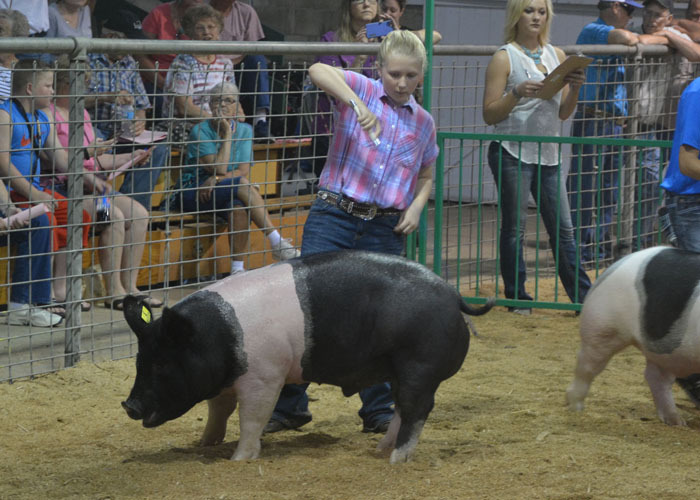 Below is a picture of our oldest, B showing one of her pigs at the fair. The first thing our kids do when they get their 4H animals is name them. These animals are washed regularly and also brushed daily for about a month leading up to fair. 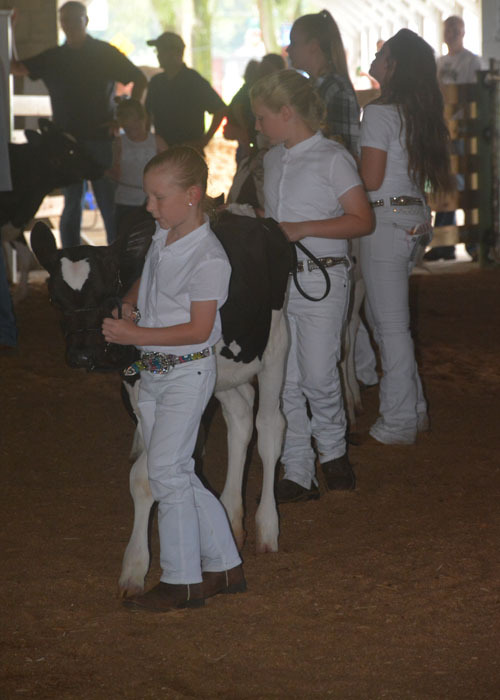 They are also walked in preparation for the show ring. Walking is a form of exercise for the pigs. 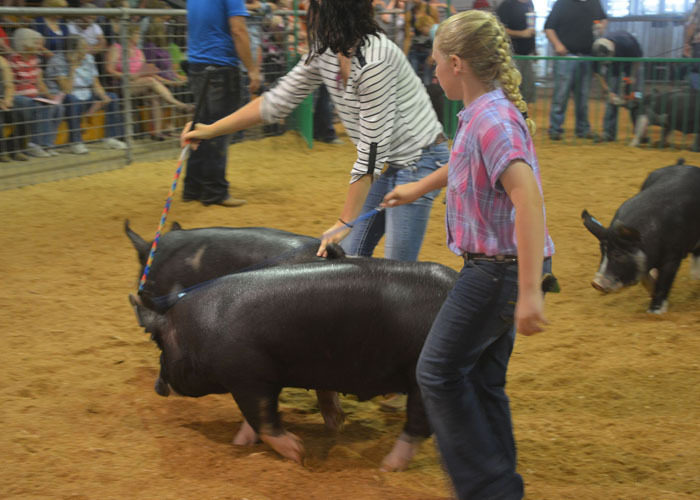 Our girls spend A LOT of time with their 4H animals, just like all the other 4Hers out there. To say that they get attached to these animals is a HUGE understatement. After the fair, when it's time to say goodbye to their pigs there are usually many tears shed, BUT our girls also know that is how the food cycle works and with watery eyes, they look forward to next year when they get new pigs. We have always been up front with our girls about where their food comes from. They live and breathe farm life every day and I feel it is important for them to know. That being said, we do not "eat" our 4H animals per say. Our girls know where they go from the fair, but they don't end up in our freezer. Some people do this, but I just know it would be too hard on the girls. We do have a beef processed from our farm yearly for our own personal freezer. Our girls know that these beef cattle come from our farm, but like I said before, they know this is the circle of life. The girls participated in the Summer Reading Program at our local library this summer. The theme was Hoosier Quest and since Indiana is celebrating it's 200th birthday this year, it was all about the history of our state. At the first program there was a magician that came and acted as if he was from the 1800s. Somehow the subject was brought up about cattle and hamburgers and a little boy said something about not eating cows. The magician said, "Well, do you like to eat hamburgers?" To which the little boy replied, "Yes." The magician cleared that up rather quickly. 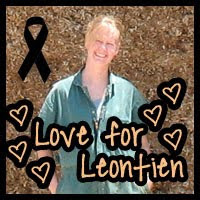 I understand that it can be difficult for some people to understand, but this is our livelihood and this is what we do. 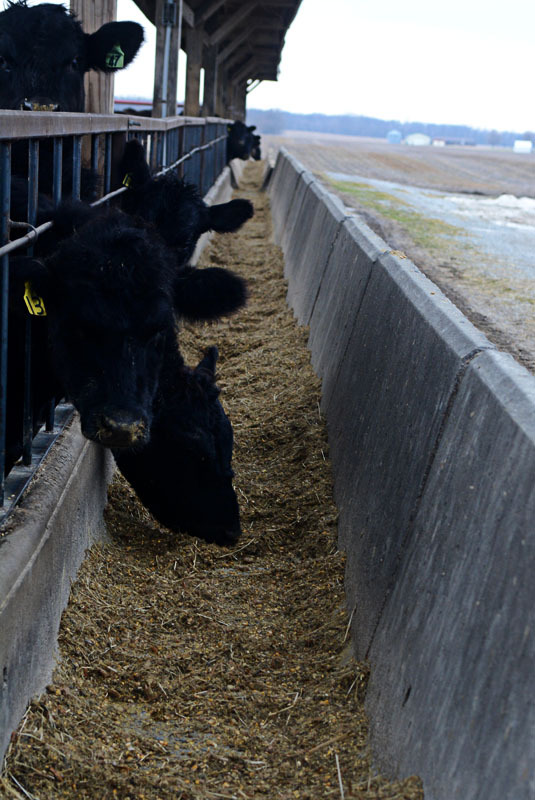 The beef cattle on our farm are cared for daily and are fed the perfect ration of feed. They are checked daily to make sure they aren't sick, and they always have clean water and bedding, but we try no to get too attached. 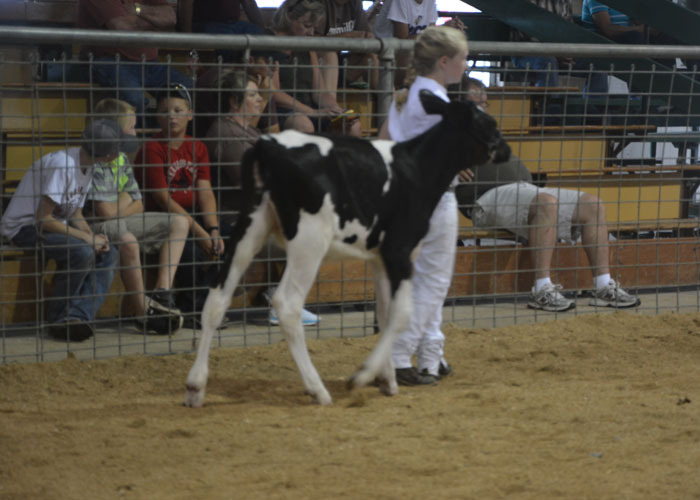 Below are some pictures of the girls (and your's truly:)) showing their dairy heifers/cows. A heifer means they haven't had a calf yet. After the fair, they will bring their dairy calves, heifers, and cows back home, unlike the pigs. The hiefers will remain on our farm until a few months before they calve, then they will go to a neighboring Amish farm who has a dairy, where he will take care of them and ensure they have the proper care. There is a big difference in the equipment needs for dairy and beef cattle and we aren't set up to handle dairy cows, but luckily they are just down the road, so we visit them often. B and Peyton. Peyton is a 3 year old cow who just had her first calf in April....which is the April that B is showing in the picture above. 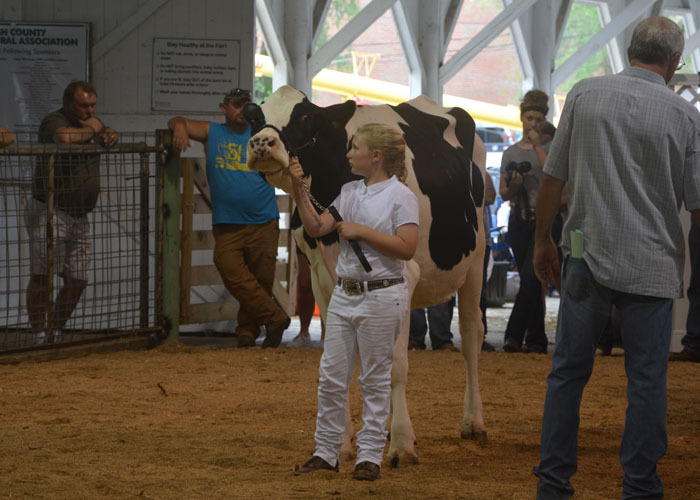 And here is a picture with me in it and it appears B is telling me what to do in the show ring:) I am leading Mel's 3 year old heifer, Elsa. She is expecting her first calf in December.